Figs are here! I LOVE fresh figs. I get so excited when I see those compartmentalized boxes filled with the beautiful purple or green varieties, all lined up in neat little rows. If they are semi-soft—ripe and unblemished, with a beautiful shape and stem—I’m pretty much in heaven. That was the case a few days ago, when I made the little first course you see in the picture. This is not so much a recipe, but a suggestion of the combination of great ingredients to make a fantastic dish. 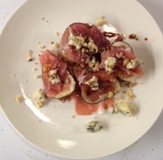 Once again, this is all about the ingredients: if the figs are great, the prosciutto from Italy (de Parma) are very thinly sliced, the English Stilton are divine, the walnuts are super fresh and toasted, and the olive oil and balsamic vinegar are great quality, then you are set to make something truly amazing! It’s easy, and you always should have the good quality ingredients on hand as much as you can; you will use less of them, because they pack more flavor and they’re most likely better for you. First, toast the walnut halves at 375 °F in a cake pan for six to eight minutes—once you start smelling them, take them out. Toast extra to have on hand for the next time or for green beans. For two plates, place four fig halves on each. Take the slice of prosciutto, tear into four pieces, and wrap around each fig half. Drizzle with a tiny bit of olive oil (about one teaspoon on each plate) and then drizzle with a tiny bit of vinegar, too (a few drops). Serve immediately and listen to your guest tell you how much he/she LOVES you!